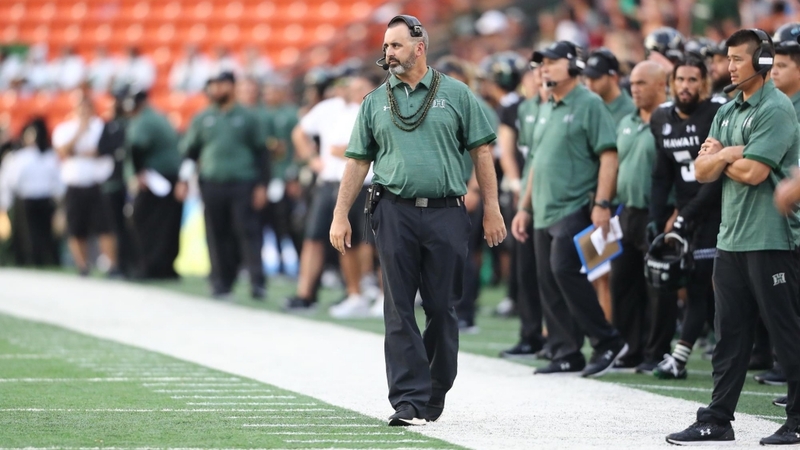 The University of Hawaii Football head coach joined The Bobby Curran Show on location at the Rainbow Warriors’ spring practice. 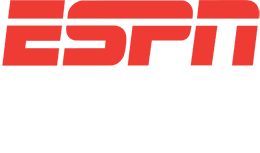 The Associate Head Coach and Offensive Coordinator for the CFL’s Hamilton Tiger-Cats, and former UH Football Head Coach, joined the Bobby Curran Show on location at the Rainbow Warriors’ spring practice. The Hawaii Football Cornerbacks coach chats with Bobby Curran on site during the Rainbow Warriors’ spring practice. Gabriel Iniguez DL 6-2 255 Pittsburg, Calif. Pittsburgh HS 2/6 12:52 p.m.
Lincoln Victor ATH 5-10 165 Vancouver, Wash. Union HS 2/6 8:48 a.m.
Mekel Ealy WR 6-3 180 Oakley, Calif. Freedom HS 2/6 5:10 a.m.
Caden Hilborn OL 6-5 285 Salt Lake City, Utah Highland HS 2/6 4:35 a.m.
Boone Abbott QB 6-2 175 American Fork, Utah American Fork HS 2/6 4:34 a.m.
Tavion Allen DB 6-0 170 Avondale, Ariz. Cesar Chavez HS 2/6 4:15 a.m.
Djuan Matthews DL 5-11 280 Houston, Texas Cyrpess Ridge HS 2/6 4:14 a.m.
Travon Killins DB 6-0 175 Daytona Beach, Fla. Spruce Creek HS 2/6 3:18 a.m.
Cortez Davis DB 5-11 178 Flowery Branch, Ga. Itawamba Community College 12/19 2:16 a.m.
Zach Daniel QB 6-0 190 Houston, Texas The Kinkaid School 12/19 3:11 a.m.
Zach Bowers LB 6-0 215 Chandler, Ariz. Chandler HS 12/19 5:13 a.m.
Mason Vega DL 6-3 265 Rancho Cucamonga, Calif. Chaffey College 12/19 5:17 a.m.
Tauivi Ho Ching LB 6-1 230 Nu’uuli, American Samoa Mt. San Antonio College 12/19 5:17 a.m.
Kaimana “Bubba” Wa‘a OL 6-2 293 Corvallis, Ore. Crescent Valley HS 12/19 5:43 a.m.
Jared Smart WR 6-0 180 Dublin, Calif. Laney College 12/19 6:15 a.m.
James Phillips WR 5-9 155 Menifee, Calif. Mt. 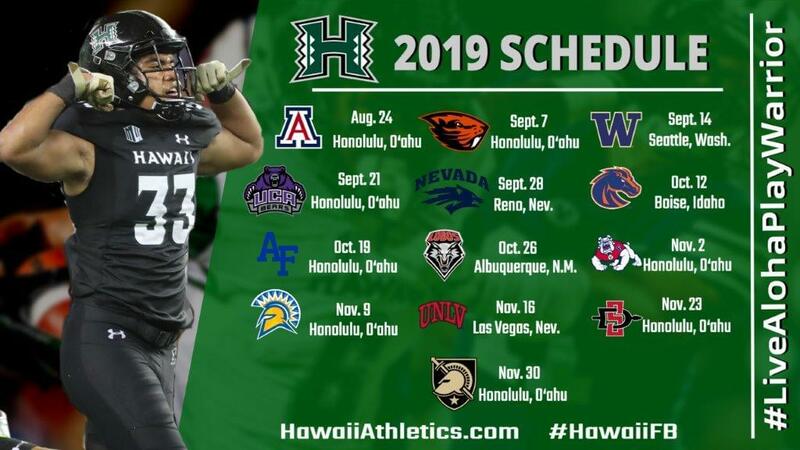 San Jacinto College 12/19 6:57 a.m.
Tiger Peterson DB 6-1 195 Honolulu, O‘ahu Kamehameha Schools-Kapalama 12/19 7:19 a.m.
Arasi Mose OL 6-5 345 Honolulu, O‘ahu Saint Louis School 12/19 7:20 a.m.
Darius Muasau LB 6-1 225 Mililani, O‘ahu Mililani HS 12/19 7:39 a.m.
Melquise Stovall WR 5-9 190 Lancaster, Calif. Riverside City College 12/19 7:49 a.m.
Steven Fiso ATH 6-2 191 Aua, American Samoa Faga’itua HS 12/19 2:51 p.m.
University of Hawaii head football coach Nick Rolovich joins The Sports Animals to discuss the early signing period and their new Rainbow Warriors. FUN FACT: Melquise Stovall, made his college football debut in 2016….against the Rainbow Warriors. Stovall snared 4 receptions for 61 yards and a TD to help the Cal Bears beat UH in the season opener in Australia. The game also marked the head coaching debut for Nick Rolovich. On the prowl and ready to #DefendPrideRock! ⚓️ of the offense line on the state's 3X state champion Saint Louis School. Big-time linebacker from state runner-up Mililani HS. Rise and shine #HawaiiFB 'ohana. #NationalSigningDay has begun with our first signee! Texas QB Zach Daniel is signee No. 2. Hard-hitting linebacker from Arizona is our next signee. The American Samoa pipeline continues with this Mt. San Antonio College linebacker. Speedy receiver from Laney College put pen to paper! Another speedy wideout joins the #RunandShoot. Defensive lineman from Chaffey College has made it official!